The following was posted to one of the internal blogs at work, the poster will remain anonymous unless they later wish to be credited. Then we aspired to be leaders, oh boy, we were going to be market leaders. So we did some research, it was probably good enough. And we spent time hiring, always looking for those that were just good enough. Then we planned what hardware, software and design would also be good enough, and speced that out. Then we worked so hard, too damn hard for three years, and we shipped our phone. And some ungrateful people said 'I am not sure if three years ago that would have been good enough', but that phone sold. It sold well, and we thought that was good enough. And when some of my team would explode with rage. When they would scream at me that did I think all the success that came before me was just because we were good enough? And I would calm them down, and keep on telling them that we just needed to be good enough. And I kept telling them this over and over and often they would accept this and hopefully get everyone else to reach the same standards. If not, they could always leave. Or at home, sometimes my son looked up to me and looked me in the eye to ask 'Daddy, am I good person?' 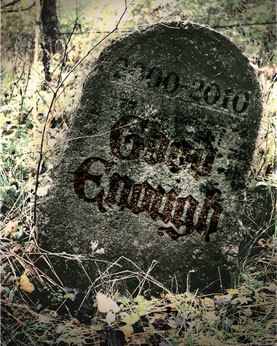 and like my own father to me I told him, 'son, you are good enough'. And when I had a personal crisis, when I spent weeks in therapy with a sudden feeling I had wasted my life, that I never had become all I could have been. Because I never reached for the impossible, I never found how far I could have gone. Because I never expected more from my friends, family and colleagues, they never gave me more than that. All the great ideas I had, that if I had mentioned maybe my fellow colleagues, the ones we accidentally hired and turned out to be better than good enough, maybe they would have gone away and thought about those ideas, and got excited, and maybe even found they could be done. But then my therapist put his hand on my shoulder and said 'no, you have to be happy with just being good enough because that is all you should ever ask of yourself and anyone around you'. Then at the end I lay on my death bed and looked back at it all, and I know I will be remembered fondly. Because after all I was good enough."